After installing Ranet Analytics, before starting the application it is necessary to add users in the group Administrators manually in order to get an access to Designer services and possibilities to change entities and resources of the project. 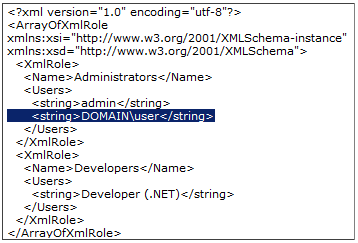 Add necessary domain users in the group of Administrators role users in the format as is shown in the highlighted text on the picture below. System user rights are described in detail in the section Administration. User profiles.